This digital collage was created from the Honesty & Hope Painting and Colored Pencil Drawings of portions of the spine. 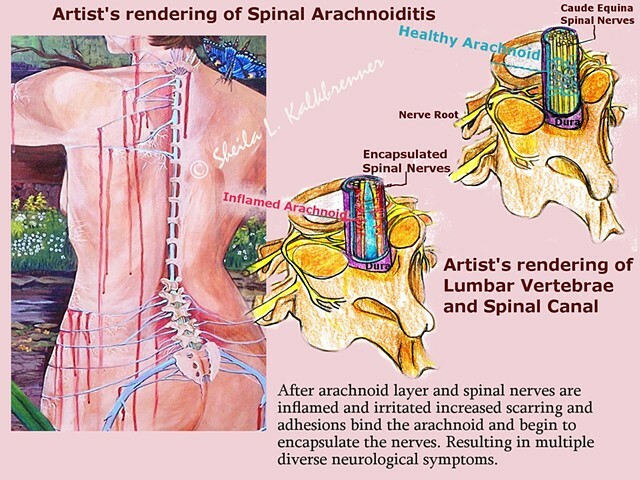 This is an artists' rendering of the concepts behind the anatomy of arachnoiditis that is being used in the Art For Arachnoiditis promotional Awareness brochure. $10 of your purchase of this unframed digital print benefits the Art For Arachnoiditis Project. This lower than fair-market value price is NOT tax deductible. Tax-deductible contributions to the project are accepted at Rocket Hub and NYFA.